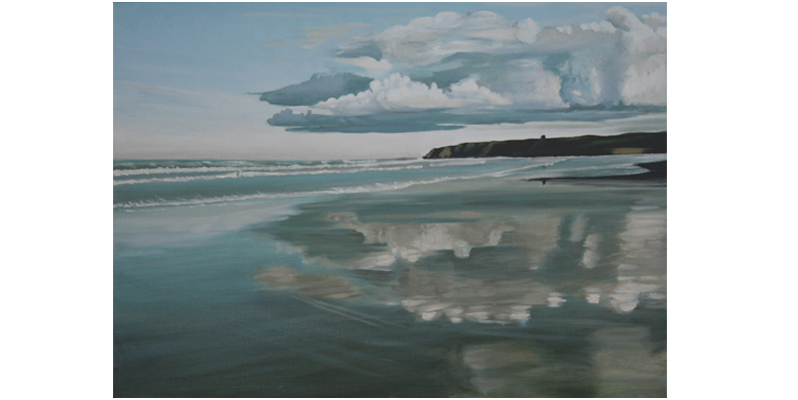 The work here uses the subject of seascapes to perform different roles. In some of the larger paintings I have used my camera as an observational tool in a way which reflects more closely the way we observe our environment. I frequently use photography for this purpose and try to observe things through the lens in a similar way to how we take in visual information naturally, focusing on interesting features but also paying attention to the broader feel of the place, giving more atmosphere. In some of these paintings the perspective is altered accordingly, sometimes also taking in movement. The smaller paintings and more abstract pieces often focus on a particular element discovered in the making of a another piece and involve developing these.